I caught this bad boy in a tree over near Boundary Bay Airport. A buddy of mine has been making the trek from North Delta over to the Delta Hospital in South Delta for the last couple of weeks and mentioned that the eagles were back on the flats. I was out late last year and earlier this year, looking to see if they were around, but I guess I was too early. The big birds are sure out there now. 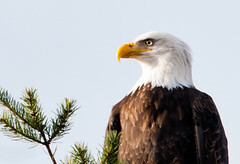 In one area around the airport, there were at least 5 trees with a minimum of 5 eagles sitting on their branches. Some of the farmer’s fields are full of gulls and the eagles are joining them to feed on something. Not sure what it could be, other than some rodents, or perhaps older gulls. Anyway, the eagles are all over the place and seem quite tolerant to people right now. Usually they are pretty skittish, but this fellow was in the middle of a off-leash dog park, so he’s probably use to people and dogs running around under his tree.